Why write this book? Of all the intricate components of the human body, the central nervous system is the most responsive to the environment, detecting and responding to changes immediately. Its complexity, however, also means that it is still one of nature’s best-kept secrets. Considering that the exploration of space is often thought of as the final frontier in the discovery of our origin and the preparation for our future, Neuroscience in Space is a book addressing the last, and greatest, scientific frontier. All living things on Earth have evolved in the presence of gravity and all of their biological systems have anatomical and physiological mechanisms designed to interpret and measure the force of gravity. However, in the near weightlessness of space, the sensory systems that provide basic information regarding linear acceleration no longer function as they did on Earth. As a result, most if not all, physiological systems dependent on the body’s central nervous system are in flux until a new microgravity state is realized. This includes adaptation of basic life sustaining functions such as blood pressure control and cardiac function, as well as other critical functions for everyday activities including balance, coordinated movement in three-dimensional space, and the regulation of sleep. Bones that supported body weight on the ground no longer have that load to bear. They begin to lose mass and strength, as do weight-bearing and postural muscles in the legs. 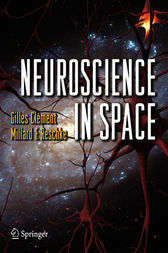 Since the first orbital flight of John Glenn, investigations have been conducted on the adaptation of nervous functions to space flight Millard Reschke and Gilles Clément have been active in this research, with experiments flown onboard Salyut, Mir, Spacelab, and 30+ flights of the Space Shuttle . This book presents in a readable text and detailed illustrations the findings from these experiments conducted during and after space missions. The authors also identify the neuroscience research that is foreseen onboard the International Space Station and what do we need to learn to understand fully the implications and risks in this area for a human mission to Mars.